From the Hancock County Courthouse, go east on Hwy 16 for 4.7 miles. Turn left on the road to the Culverton Baptist Church. Go 0.5 mile to an intersection with stop sign. Go straight across intersection to dirt road (Fulsome Creek Rd) and go for 1.4 miles to a field road on the left. Turn onto the field road and go 0.2 mile. Gonder Cemetery is about 150 feet off the road on the right. Aged 67 years. Inscription on opposite side of stone as Mark Gonder's. Aged 24 years, 10 months, and 25 days. Consort of Gen. T. Vinson. Middle initial from footstone. Large slab outside the wall covering possibly 4 graves. 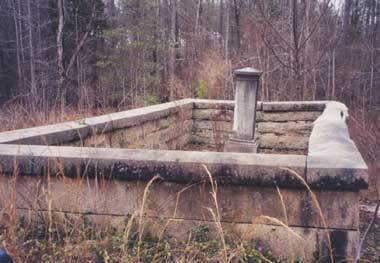 Could be slave graves.